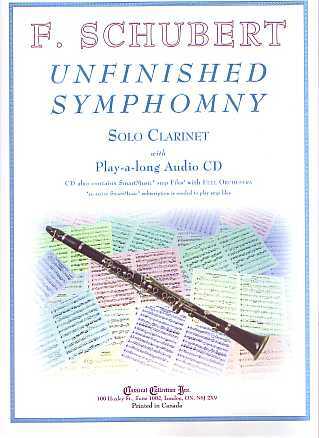 The Unfinished Symphony, D759 is presented as a Solo for Flute, Clarinet or Alto Saxophone with a play-a-long Audio CD which also contains SmartMusic SMP Files. 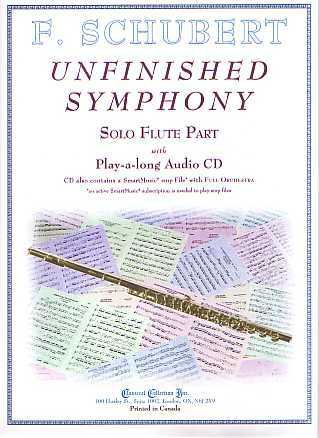 This edition of the Unfinished Symphony is ideal for anyone who is studying or listening, to better understand and, in general, enjoy the wonderful music of this outstanding piece! Franz Schubert, composer, was born on January 31, 1797 in Vienna, Austria and died on November 19, 1828 in Vienna. He is the only one of the great Classical Period (1750-1825) Viennese composers (Haydn, Mozart and Beethoven, for example) who was actually native to Vienna. Despite his very short life, Schubert composed for practically every musical medium: Religious music (including 6 Masses); a large quantity of piano music and vocal music (including 10 operas); much Chamber music (the most famous being the Trout Quintet - for Piano and String Quartet); and a vast quantity of Orchestral music including 10 Overtures and 9 (or 8) Symphonies. Austrian Musicologist Otto Erich Deutsch (1883-1967) catalogued Schubert’s works assigning each a D(eutsch) number. The Unfinished Symphony in B Minor, D759, was composed in October, 1822. It is considered to be either Symphony No. 8 or 7, depending on whether Symphony No. 7 in E Major, D729, which consists only of a sketch score, is numbered as a Symphony. Likewise, Symphony in C Major, D944 “The Great”, to distinguish it from Symphony No. 6, D589 (which is also in C Major) is either Symphony No. 9 or 8. Most Symphonies have 4 Movements, the Unfinished Symphony has only two completed Movements plus a piano Score of a 3rd Movement Scherzo. 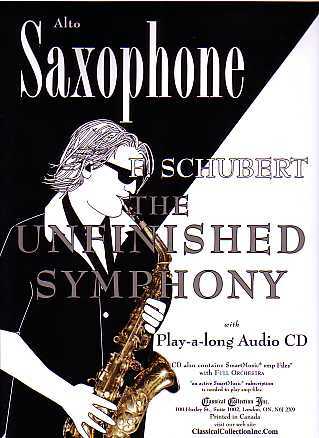 There are many theories why Schubert left the Unfinished Symphony incomplete, including the suggestion that it is actually “complete” - Schubert felt that he could not add anything to what he had composed in the first two movements. In this arrangement, to make for more “friendly” key signatures, the entire piece has been transposed up a semi tone from Concert B Minor to Concert C Minor in the 1st Movement and from Concert E Major to Concert F Major in the 2nd Movement. The Clarinet Book CD contains Audio and SmartMusic versions for both Bb Clarinet and (as MP3s) Clarinet in A, for Clarinetists who want to play the work in the original key. Piano Accompaniment Book with Audio CD ($9.95) also available.